E-Commerce Website, Logo & Collateral Materials, Photography Services. Website Graphics & Photography by Alev. Men and women now can protect their hair while improving its health and natural beauty by using The Sleepy Hat 100% Silk Products. 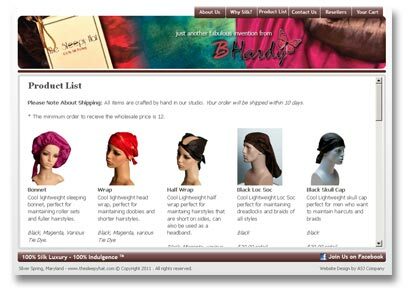 The Founder of BHardy Inc. took the concept of tying her hair with a silk scarf and created a bonnet made with an elastic band out of 100% silk. As an end-result The Sleepy Hat was born. An original e-commerce website design, shopping cart and payment gateway, logo design, brochure, event specific marketing materials, copywriting and social media setup. ASJ also provided the product photography used on the website and materials.